New Hampshire is often ranked as one of the healthiest states in the nation; however, it also has some of the highest rates of alcohol use, marijuana use and non-medical use of pain relievers among youth, young adults, and adults. 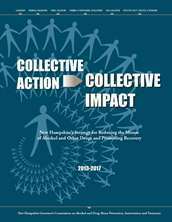 In collaboration with many stakeholders and partners, JSI, as the contractor for the New Hampshire Center for Excellence, helped to initiate a strategic planning process, review state level data, and gather community input to develop a five-year strategy encompassing two core goals to reduce the percentage of New Hampshire residents misusing alcohol and other drugs and to increase the percentage of individuals with substance use disorders receiving treatment and recovery support services. JSI Research & Training Institute, Inc., 2013.